It is well worth while searching the graveyards before you make your journey to Youghal. Where possible a grave inscription was deciphered, a photograph taken with a GPS enabled camera and a map of the graveyard made. 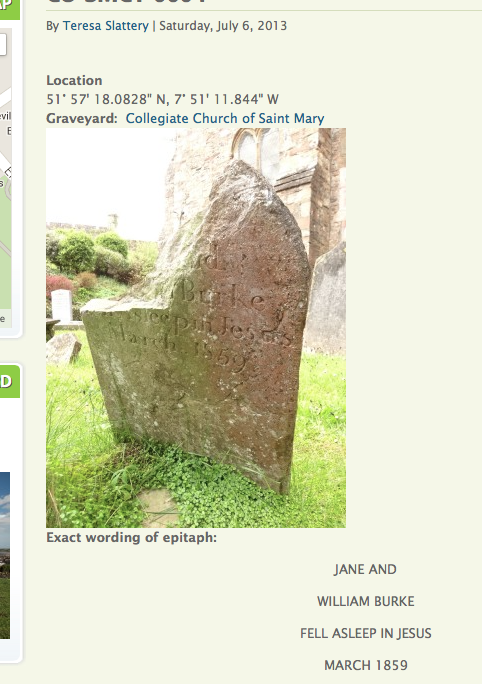 The photograph is from St. Mary’s Collegiate Church , Youghal where volunteer Teresa Slattery – on her own – mapped the entire graveyard! There is a computer in the church where you can search freely the database which includes some graves which are no longer legible. You can see exactly where the grave is, you can read the inscription. The same applies to most of the graveyards around Youghal. You might not have the name of the graveyard but the website will help you out.